I enjoyed working on the black Art Spectrum paper more than I had expected to in the workshop I took last weekend. And in fact I've already sold the Sunrise painting that I did on the black paper. I had some black paper around that came in the sampler packs from Art Spectrum that come in various warm or cool colors. I had never liked the black so hadn't used some of the sheets I had. 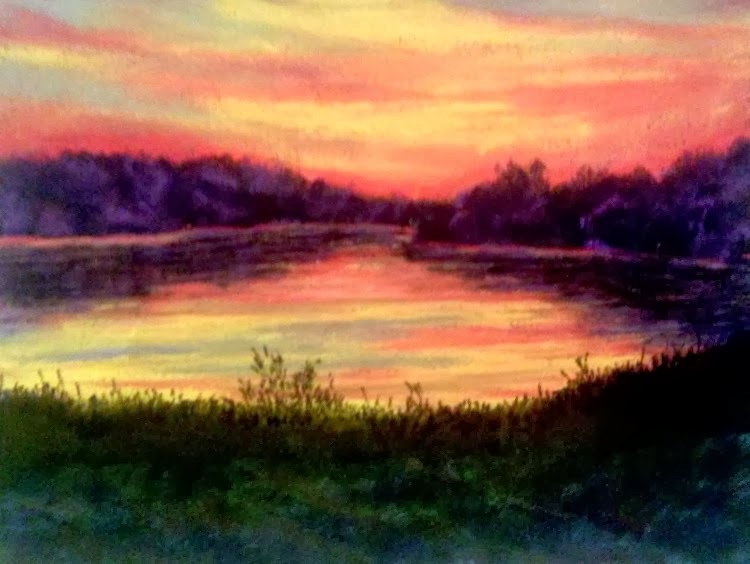 But I pulled one of them out tonight and painted this picture of a sunset up in Port Elgin, New Brunswick, when I was coming home one evening from my life drawing session over in Tidnish, Nova Scotia. I think I like my sunrise painting better, but I had fun doing this one also. Sunrises and sunsets seem to be good subjects for the black paper, which was the standard 9x12 size.